We invite you to explore India - the Land with infinite beauty ! Whether you soar high into Himalayas or peer under the ruins of the Ancient monuments dotting the landscape of India, you will cherish the experience long after your visit ! This India Travel Guide on Kemmanagundi is free from any commercial interest! This site is dedicated to promote India - the vast subcontinent, its glorious past, magnificent landscape and its infinite variety. Kemmanagundi collectively means a place with red soil. This place was the summer retreat of the Maharaja of Mysore, Krishnaraje Wodeyar IV. As the King visited this place year after year, the place is also known as Sri Krishnarajendra hill station. Kemmanagundi is located in the hill ranges of Baba Budan Giri. These hill ranges bear the legacy of being home to Karnataka's tallest peak Mullayangiri. Panoramic green foliage, beautifully landscaped gardens, silver cascades, enchanting mountains, breathtaking valleys and mountain streams rejuvenate the eyes and soul. Kemmanagundi with its thick forests, fresh water springs, breezy climate and calm atmosphere is an ideal holiday spot. The Royal Horticultural Society of Karnataka has its foundation at Kemmanagundi and maintains the gardens, resort and its surroundings. For the adventurous lot, Kemmannagundi has numerous jungle paths to explore and numerous peaks to scale through. The drive from Chikkamagaluru to Kemmanagundi is a wonderful experience in itself. The scenic beauty on this mystic terrain is unveiled by the winding roads. The silent meadows, rolling mist and clear water in the spring are breathtaking to enjoy and watch. Silver oak trees and the coffee plantations fill the air with a sweet scent. 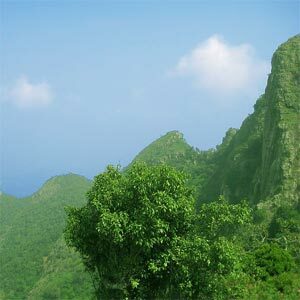 This mountain is also famous as the paradise of Karnataka. The nearest railway station is at Tarikere. Well connected by road, Kemmanagundi can be reached by road from Bengaluru as well as Chikkamagaluru. The nearest airport is Mangalore. Hebbe falls: Water flows down from a height of 168 meters. The water passes through two stages of the falls; namely Dodda Hebbe (big falls) and Chikka Hebe (small falls). This falls is located about 8km from the Raj Bhavan. Visitors can walk down the distance or hire jeeps. Kallathi falls: Also known as Kallathigiri falls or Kalahasthi falls, water streams down from a height of 122 meters. A temple belonging to the Vijayanagar Empire is located here. This falls is located 10km from Kemmanagundi and can be reached by road. Rose garden: Maintained by the horticultural department, a variety of roses are cultivated here. Z point: A wonderful spot to view the sunrise, this place can be reached after a steep uphill trek. En-route visitors can get to see Shanthi falls. The slippery roads can pose a challenge for trekkers. Raj Bhavan: Watching the sun set from Raj Bhavan is a spectacular sight. Horseways of the maharaja: A 4 feet broad narrow way in the creek of the hill is called the horse way. Identical horseways can be found on almost all the mountains of Kemmanagundi. Muthodi game reserve: Driving into the deep jungle to watch wildlife, the forest department van/jeep takes the visitors to the waterholes of wild animals. The lush green vegetation is a beautiful sight. Kemmanagundi enjoys wonderful climate throughout the year. The best season to visit Kemmanagundi is from September to February. Visiting Kemmanagundi in the monsoon can also be a refreshing experience though you can get real wet. Government run guesthouses are considered the best option for stay at Kemmanagundi as they are economical. Home stay options are also available. Home stays are generally in big bungalows that have been converted into commercial living spaces. Home stay options are available in and around Kemmanagundi with all meals included. Some may offer guided trekking expeditions. Check all the options available before you make the booking.